If you’re looking to get away this summer, you might not have to go too far from home to enjoy the perfect holiday. The UK is packed full of beautiful places you can visit. While it isn’t known for its tropical climate, the weather can still get pretty hot. Below you’ll find the top 5 places to head to if you fancy a staycation this summer. South and west Wales has some of the best beaches in the country and Tenby is by far one of the most popular. This scenic harbour town has something to suit everyone. If you’re looking for a relaxing holiday you can laze on the beach or take a gentle stroll along the cobbled streets. If you’d prefer a more action packed holiday there are plenty of sporting activities you can try out. It’s also recommended you take a boat trip to Caldey Island where monks reside. 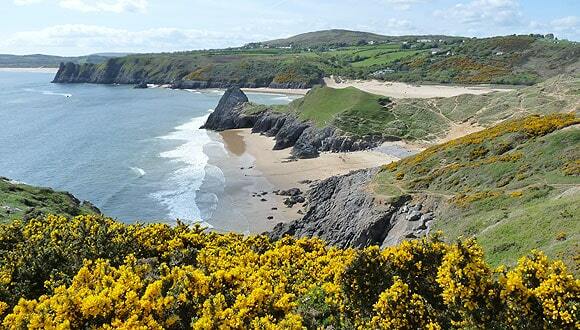 If you hire a rental car you can also explore the surrounding Pembrokeshire areas. Scotland is often criticised for its bad weather, but in summer that all changes. Loch Ness is one of the best places to head to and it attracts thousands of tourists each year. It’s actually the biggest lake in Scotland and it stretches an impressive 20 miles in length. Most people have heard of the Loch Ness monster and this is where the myth started out. There are also plenty of historical tourist attractions nearby. Cornwall has so many beautiful places you can head to. Why not hire a rental car and take a road trip around the county? From top tourist destination Newquay to the picturesque town of St Ives; there’s something to suit everyone in this laid back part of the country. You’re guaranteed to witness beautiful views, enjoy fantastic weather and experience some of the best attractions in the UK. Shere was made famous by the film ‘The Holiday’ starring Cameron Diaz and Kate Winslet. This pretty village is stunning in summer and it’s the ideal getaway for couples. There are cosy little pubs and excellent local cuisine is served. There are a lot of walks you can go on and what’s more, it isn’t that far away from London. Covering over 25 miles, the Cotswolds are a popular tourist destination in the summer months. Made up of picturesque towns and villages, there’s plenty to see and do. Ideally it would suit those looking to really get away from it all. Boasting a fantastic tranquil atmosphere, you’ll feel relaxed and refreshed after a break in the Cotswolds. Wherever you choose to head to, it’s a great idea to rent a car. Road trips can be a great way to spend time with your friends, family and loved ones. You get to explore the different destinations at your own pace without having to rely upon public transport. It can also be cheaper to use a hire car rather than your own car in some situations. If you own a car or van that has a high fuel consumption, hiring a car could save you money. Overall the UK is a great place to holiday in the summer months. It doesn’t get too hot, there’s plenty to see and do and there’s something to suit everyone.